Come out for free family fun with a conscience on February 7, 2010 at the Japanese Language School (487 Alexander St., Vancouver) from 1 - 3 p.m.Watch the Games (Welfare Hurdles, Skating around Poverty, and more), cheer the Mascots (Itchy the Bedbug, Creepy the Cockroach and Chewy the Rat), boo the Bad Guys (Mr. Bid and Mr. Con Dough), sing along with the Poverty Anthem, eat cake and be merry! Be sure to stay tuned to our blog - we’ll show you lots of behind the scenes action including features on the individual Poverty Olympic athletes - their training schedules, what they’re eating, their uniforms, and a sneak peek at their family life (find out how they juggle competitive sport and a personal life). 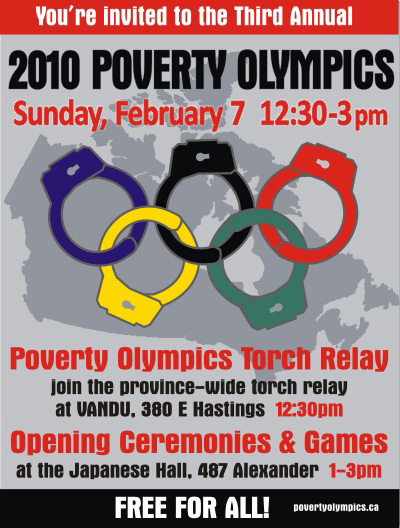 We’ll also post updates on the Poverty Olympics Athlete’s Village, the venues for the Games, the Official Sponsors, the mascots, and much, much more. 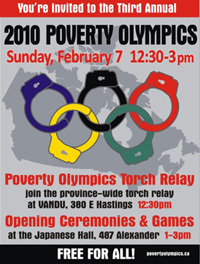 The Second Annual Poverty Olympics was held on February 8, 2009 at the Japanese Language School in Vancouver.